As I get off the shinkansen in Kyoto, Yoko emails me to say she’ll be late. Which gives me plenty of time to drop by one of the conveyor-belt sushiya I liked for lunch. The most affordable way to get fresh sushi; only 1230¥ for 9 plates, most carrying 2 sushi each. After which I walk to Shijo avenue to meet Yoko and her friend. 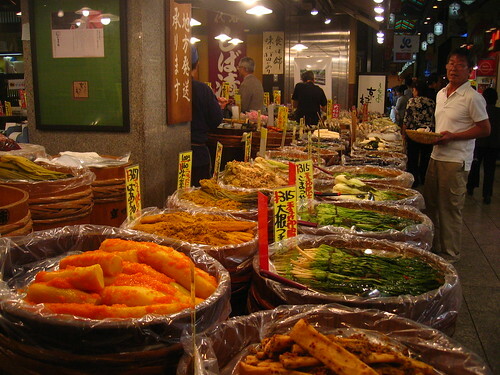 We stroll around in the pedestrian merchant streets, visiting small furoshiki shops, local clothes designers and narrow market alleys crammed with stalls of vegetables, fish, spices, tsukemono, hand-made cutlery, fresh mochi sweets, etc. Kyoto is extremely touristy, but in an entirely different way from Tokyo. Here the mood is provincial, more serene. I do spot foreigners, but also many locals stopping by their favorite shops. Everyday life in Kyoto feels more traditional, less postmodern. As dinner-time draws near, we walk south through small alleys filled with tiny restaurants to get to Giro Giro, where Yoko has booked a table for us. 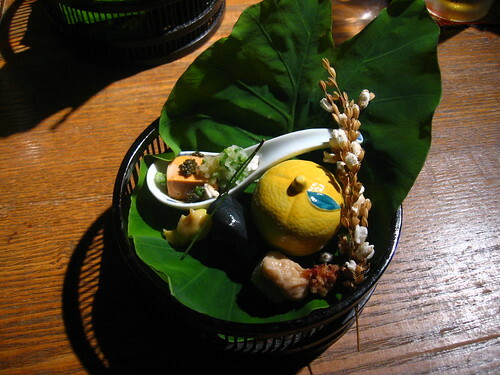 A small but famous kaiseki restaurant, the top-notch Japanese cuisine served as a series of creative specialities, each of near autistic perfection, both esthetically and gustatively. If you can picture “culinary ikebana”, it’s a good start. The successful modernization of this old-style wooden 2-storey place with a glass facade opening on the Takasegawa canal illustrates the retro-modern approach of the food itself. 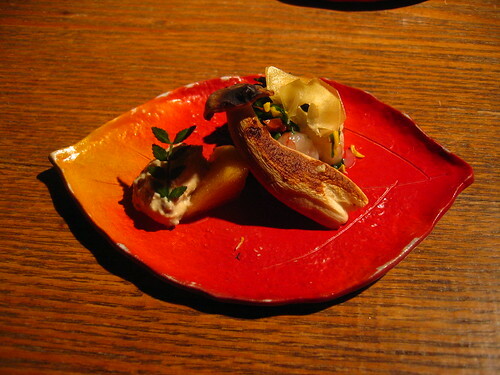 In addition to being heavenly exquisite, the 2-hour, 8-dish menu also happens to be very affordable (3500¥). Once the feast is over, we walk back to the city, only stopping to gaze at a traditional sentō placed by the river. The wooden bath house strongly reminds us from that in Miyazaki’s Spirited Away (AKA Chihiro). No supernatural creatures here though. However, among the shadows, we spot the distinctive shape of a geisha’s elegant coiffure. We won’t see more of course; the magic is all in the secrecy. Having left my backpack in a locker, I leave my friends and, still tipsy from the sake, zip passed izakaya and hostess bars, cross the light and noise of Shijo to reach the bank of the Kamogawa river. I like the darkness there, the fresher air, the city reduced to a whisper behind the flow of the water. I walk along the stream. On my right, equidistant groups of friends, lonely girls and lover couples cuddling in the dark. On my left, silent scenes in lit-up restaurants behind windows: customers sitting cross-legged on the floor, waitresses in yukata, tables of businessmen, immaculate paper panes and wooden bar counters. 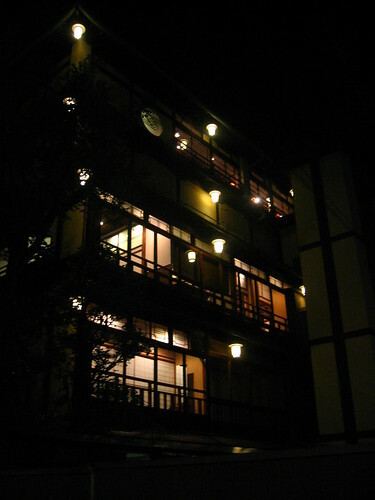 There is no better place to listen to Air’s Alone in Kyoto.